With tighter emissions norms and increased focus on greener technologies now, almost every car manufacturer is busy developing an alternate to the conventional petrol and diesel powertrains. Toyota had launched the Prius in India back in 2010, when selling hybrids was still considered to be quite a bold statement. More than that, the Prius showed the company's commitment to bringing in more advanced and efficient automobile technology to the country. This, even when the segment was not one which would sell in large enough volumes to make it a safe bet for any car manufacturer. With the growing awareness of hybrids and EVs in India, the outlook towards such offerings has also changed. And this is evident by the sizeable number of Toyota Camry Hybrids sold in the country. 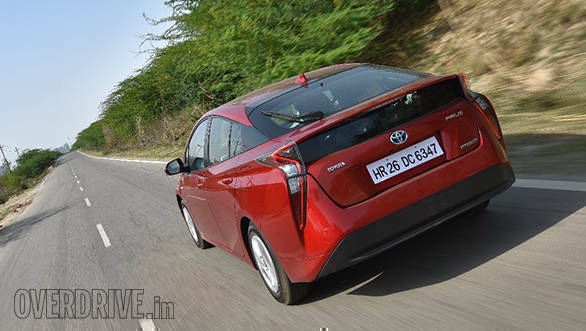 Toyota has now brought in the new-generation avatar of the Prius in India. With a new design language and more efficient tech under the skin, the original poster boy of hybrids in India looks all set to mark its niche. But then, does it? We find out. The new-gen Toyota Prius has received a smart makeover which makes it a lot sharper than before. It still remains a unique-looking automobile on the road -- perhaps something like what the Jetsons would drive around. I wasn't too convinced about this design when I saw the images but in flesh, it looks a lot more appealing than the previous model. The front now carries an aggressive design which can be seen with the sharp lines of the headlight along with the multiple creases on the front bumper. The air vents on the bumper aren't just for aesthetics as the grille shutter actually controls the airflow into the engine. Moving on to the side, Toyota has retained the overall silhouette of the previous car, but at the same time, has made it more aerodynamic. I also noticed design cues from the Toyota Mirai. The height has been dropped by 20mm while the position of the spoiler has been lowered too. Collectively, it has improved the coefficient of drag to 0.24, which is better than in a Nissan GT-R. The new Toyota Prius is also longer and wider than its predecessor. Past the B-Pillar, it gets multiple crease lines with the most prominent one being the rising waistline. The coupe-like roofline flows down to the rear making it a notchback. 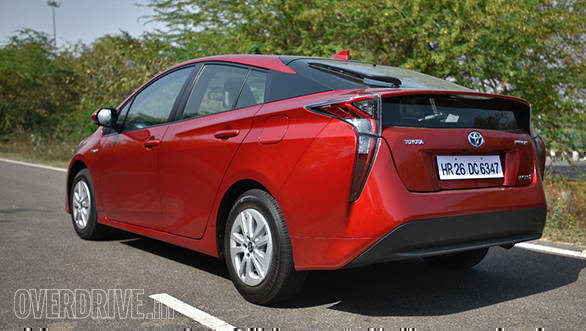 While photographing the new Prius, Rohit and I realised that it is the rear profile that gets more points than the front as it features newer elements and looks pleasing to the eye. It gets slim vertically-positioned LED combination lamps, a boot integrated spoiler and a diffuser. Step inside the new Prius and you'll wonder if the car is still in its concept stage. And that's because the cabin layout has got a serious overhaul from the earlier iteration. Instead of the vanilla themed dashboard, it gets a two-tone design that flows along the width of the car before blending in with the door panels. The AC vents with the contrasting turquoise detailing are a nice touch too. The 7-inch touchscreen infotainment system is placed on a large piano black panel that is mounted on the dashboard. 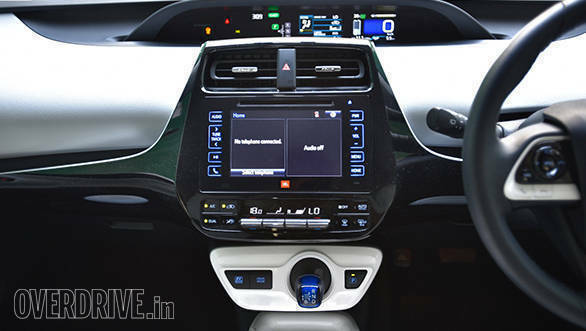 It looks identical to what we have seen in the Toyota Innova Crysta and the Fortuner and also offers the same functions. While it has a simple user interface, it does appear dated compared to the modern options like CarPlay and Android Auto that even some of the sub-Rs 10 lakh cars get. In addition, it also misses out on a navigation function. There is also a 4.2-inch multi-information TFT screen placed on the top of the dash and it displays information on the gear engaged, drive modes and other car related data. Toyota has played it smart with the overall cabin design. It looks upmarket and at the same time utilises the space in the best way possible. There is an independent stack under the central unit that features drive mode buttons, a gear selector as well as a park button. Additionally, the central tray positioned between the seats comes with a wireless charger, two cup holders and a large storage box under the armrest. 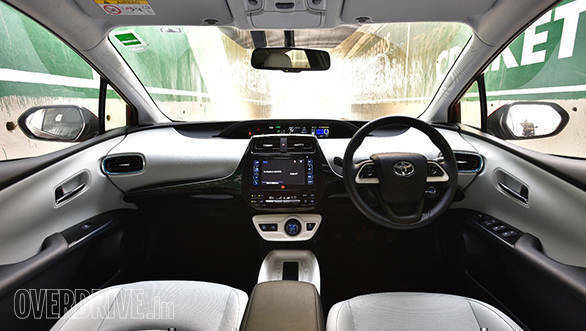 The light colours in the Toyota Prius' cabin give it an airy and spacious spacious feel. Adding to that are the comfortable seats. While the front and rear seats come with adequate cushioning, the under thigh support for the rear passengers could have been better. Legroom is decent in both the zones but not in the same league as the Toyota Camry which also comes equipped with reclining rear seats. Additionally, the sloping roofline could make taller rear occupants feel a bit crammed. The new-gen Toyota Prius retains the 1.8-litre 4-cylinder petrol motor from its predecessor that makes 98PS and generates 142Nm of torque. On the electric front, it features a 72PS/163Nm motor. The combined system output is rated at 122PS. While these figures are similar to the previous car, what has changed significantly is the response from the hybrid system. When you turn on the ignition, the petrol motor isn't fired up. Instead, it will run purely on the electric motor till 60kmph if you're not too aggressive with the throttle, which is ideal in slow-moving traffic. However, step on it, and the petrol motor quickly springs to life and gives you the necessary push. Like the Toyota Camry, the Prius features an e-CVT, which replaces the pulleys from a conventional CVT with an electric motor. It also features nickel-metal hydride batteries like the Camry. This is old and heavy technology compared to the lithium-ion batteries in the Honda Accord. It's quite surprising that Toyota is still using this tech while the competition has moved ahead. The Toyota Prius features three driving modes -- Normal, Power and Eco -- and the difference in each of these is quite evident. On start up, the Normal mode is activated by default and it will summon the petrol engine the moment the battery charge is low or when the car exceeds 60kmph. In Eco mode, the throttle response is toned down and so is the air-conditioning to improve the fuel efficiency. This is ideal for driving in bumper-to-bumper traffic. The reduced throttle response doesn't make the car feel sluggish, as electric motor produces sufficient torque immediately. Once we were on an open stretch, we shifted into Power mode. The transitions between these modes is smooth and so is the shift from pure EV mode to when the petrol motor comes to life. In power mode, the AC unit's performance isn't affected and the petrol motor is working in full swing. Undoubtedly, this remained my pick among the three settings on the highway as the system felt more spirited and enthusiastic to perform quick maneuvers. Additionally, that the car reaches higher speeds without much effort in this mode. 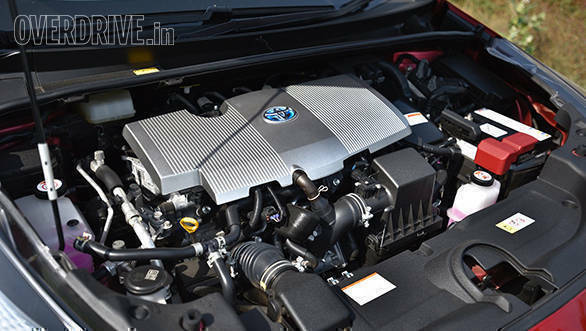 Toyota is claiming an overall efficiency figure of 26.27kmpl. We're currently testing real-world efficiency figure now and will update the story once we're done. The highlight of the new-gen Prius is the Toyota New Global Architecture (TNGA) platform with its lowered centre of gravity and updated suspension package. The benefits of these can be seen with the impressive ride quality. Even though the new-gen Toyota Prius looks large in dimensions, driving it in the city in peak traffic is very convenient, thanks to its compact dimensions. Helping its cause is the steering wheel that rightly weighs up as the speeds increase. The small turning radius makes it easy to manoeuvre around tight parking lots or similar situations. However, the biggest talking point of the new Prius is its suspension setup which will be thoroughly enjoyed by all the occupants in the car. The front wheels get McPherson struts while the rear comes with a new double wishbone arrangement just like the international-spec car. The setup is tuned to offer a softer ride which irons out the uneven undulations without any effort. The setup is rightly damped as the ride is almost unaffected while driving over speed breakers. On certain rough sections, the cabin was left intert from the disturbances caused by the tarmac. As is typical of a Prius, the cabin is quite silent and the suspension does its bit by remaining quiet even over rough patches. Fortunately, the softer ride quality has not affected the way the Prius handles quick direction changes. It performs them without any discomfort. However, the 195/65 R15 Bridgestone D250 tyres that come on the Prius aren't the best when it comes to gripping the surface. These are low rolling-resistance tyres that have been designed for fuel efficiency and not for corner-carving performance. But on straight sections, the Prius feels stable while travelling at higher speeds. Toyota is going strong when it comes to hybrid cars, as the company has sold over 10.05 million units globally till January 2017, with over 40 per cent of that being Prius'. The Japanese car manufacturer claims to have reduced 77 million tons of CO2 emissions over the years. By 2020, Toyota aims to make hybrids amount to 20 per cent of its overall sales which, at present, stands at two per cent. 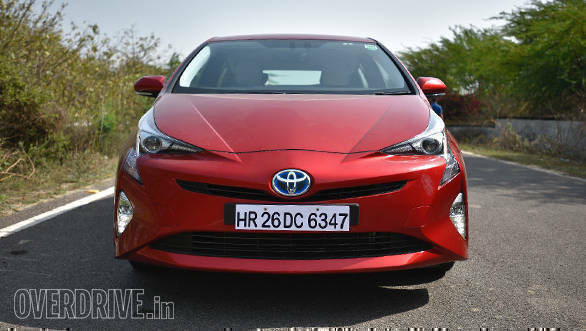 The company has also stated that it does plan to bring in more hybrids to India in the coming years. 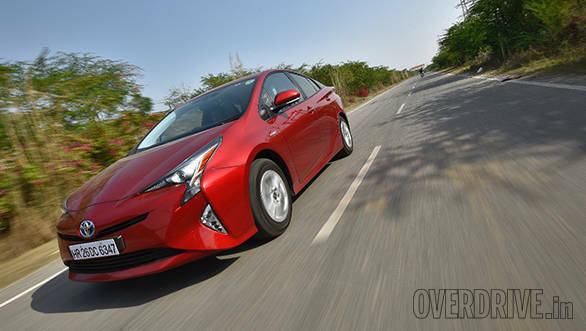 Toyota is selling the new-gen Prius as a CKD in India at Rs Rs 38.96 lakh, ex-Delhi. Now at that price, there are other hybrid options like the Honda Accord at Rs 37 lakh and the significantly cheaper Toyota Camry Hybrid at Rs 31.98 lakh. The latter two options come loaded with more features and space for the price when compared to the Prius. So do they make more sense? Well, we'll leave that for when we do a full-blown comparo. But, what we will say is that the Prius comes with an iconic image. And if you are out there to make a green statement to the world, the Toyota Prius is your best bet.